The Corn Palace has been steeped in agricultural tradition since 1892, so when the caretakers of one of South Dakota's most popular tourist attractions decided it was due for some maintenance, they also decided to gently nudge it into the 21st century. 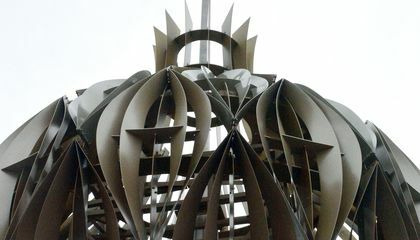 Gone are the fiberglass green-and-yellow onion domes, replaced by airy steel versions. A new marquee, larger corn murals and a walkout balcony have been added outside. And in perhaps the most modern touch of a $4 million renovation, the palace's night face now features LED lighting that plays dramatically across the building. "It needed a facelift," said Katie Knutson, director of the Mitchell Convention and Visitors Bureau. "It needed something to draw a different crowd." The Corn Palace, which also features an arena to host concerts and high school and college basketball games, draws hundreds of thousands of visitors each year. Knutson and others are hoping the new look will attract a new generation of tourists, and bring back previous visitors interested in seeing what's changed. The redesign hasn't pleased everyone in Mitchell, a town of about 15,000. Catina Kost, a Mitchell native who owns a consignment shop on Main Street, said some people think the "Las-Vegasy" look is too much of a change. She said some of the negativity might have come from the months-long delay between the old domes' removal and the new domes going into place. "There are so many people dissing it and being disrespectful about it when you read about it online," said Kost, who said she likes it. "I just try to be supportive," she said. "It's our monument in town." 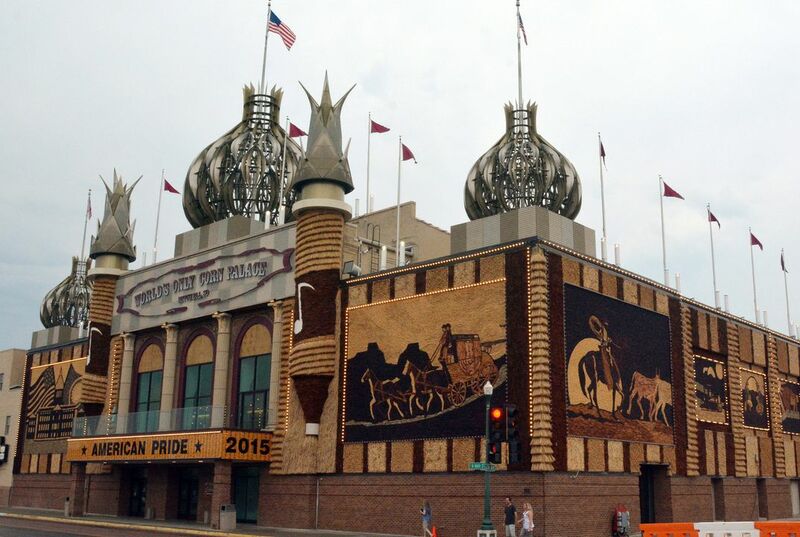 The first Corn Palace was built in 1892 so settlers could display the fruits of their harvest. Almost every year since, artists have created colorful new murals on the outside walls using corn of different varieties and color, a fall tradition that costs about $150,000 a year. The building's annual makeover begins each May when crews start tearing down the rye and sour dock that surround the murals. Workers dismantle the previous year's corn murals in late August or early September. Local artist Cherie Ramsdell then creates paintings to be enlarged and projected onto full-size black tar paper, so her designs can be outlined in a "corn-by-numbers" pattern. A crew of decorators follows her directions on where to nail each half-split cob. Diane Bollinger, a first-time visitor to the Corn Palace, raved about it as she posed for a picture alongside her husband, Allen, and daughter, Lauren. The Bollingers were making a cross-country road trip to Seattle from Charlotte, North Carolina, and their first planned South Dakota stop had been the Badlands. Repeated texts from a friend in Charlotte convinced the trio to pull off at the Mitchell exit. Summary: The corn palace, a popular tourist attraction in Mitchell, South Dakota, has been renovated at a cost of $4 million, with improvements including new steel domes, more corn murals, and LED lights along the outside. However, not everyone is in support of the new look, thinking it looks too "Las-Vegasy", with the supporters claiming the change was needed to bring the palace into the 21st century, and to attract a greater variety and higher quantity of tourists. How do people do this? People out there are so smart. They make it seem like these things are easy, but these things aren't. It's crazy what people can accomplish now a days. I'm so shocked how people do this kind of thing. Building a whole entire palace made of corn. The new metal finish and light show us what gave it a Las Vegas feel. I think that the Corn Palace is a great way of showing off our nations agriculture,and how far we've come from just a few crops to acres of farmland.